What took so long is something I won’t delve into. I had been planning to visit Amritsar for a while but nothing materialised from paper to action until a chance occurrence. My recent association with Stay on Skill brought me to the SOS Meetup right in the very heart of the city at City On Pedals. Located at a walking distance from the Amritsar Railway Station, City On Pedals is a tour and backpackers hostel with luxury dorm beds in a budget, a fun common area, and a quiet co-working space. To add icing on the cake, they also provide guided tours in Amritsar lead by a local guide who knows the city inside out. As I came to experience —on foot and pedals—in a span of three days, I’m writing down some of the must-do things in Amritsar for you to remember. While anytime is a good time to visit the Golden Temple, popularly known as Harmandir Sahib, early morning is particularly special. It’s a different feeling altogether to be there before the break of dawn and see life buzzing around the Amrit Sarovar, and the temple emanating an unparalleled golden glow. But there is a whole lot more to explore inside the Gurdwara complex. Make sure your experience is a well-rounded one. 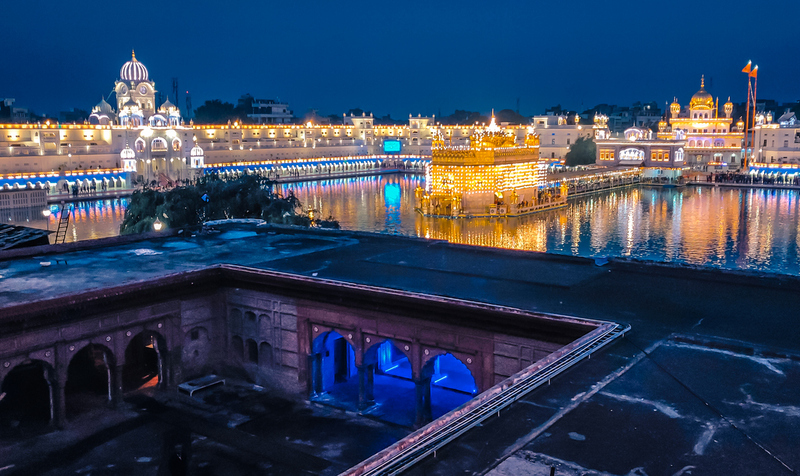 The Golden Temple Guided Tour by City On Pedals takes you on a full round, covering every inch including the Akal Takht, the Sikh Museum, and the World’s Largest Community Kitchen that offers food to over 100,000 devotees a day. Golden Temple, Amritsar, just before sunrise. The Partition Museum in Amritsar is a landmark, and not just an architectural one. What lies inside isn’t allowed to be photographed, for good reasons. For it is not just another walk down the memory lane but a slow crawl through the tragic events leading up to, during and following, probably the most talked about chapter in the book of Indian history, Partition. Because what lies inside aren’t exactly memoirs but remnants: Newspaper Cuttings, Photographs, Audio-visual Recordings and Testimonies from the survivors. Remnants of a haunting past we’re still trying to climb out of. Partition Museum, Amritsar. Also known as Town Hall. We’ve all heard the story one time too many. Located in the vicinity of the Golden Temple, Jallianwala Bagh is yet another horrifying chapter in Indian history. While the former is an epitome of faith, the latter is a not-so-pleasant lesson in how reckless hate of a few citizens can scar an entire nation. What transpired on the day of April 13, 1919, on the festival of Baisakhi, can still be seen in the bullet holes and the well into which many jumped to avoid facing the unprovoked fire. There’s also the eternal flame, remembering the victims and martyrs of India’s freedom struggle. If you are a foodie, that’s great. If you aren’t one, Amritsar will turn you into one at the first whiff of kitchen smoke. There is plenty to try here, from the traditional, famous dhabas in Amritsar to munching street side style. Your platter will always be full. Lubhaya Ram’s Aam Papad ki Chaat, Paanch Paani Golgappe, Kulche at Jamadar ki Haveli, Bharawan da Dhaba, Kesar da Dhaba, and Makhan’s Fish, these are some of places you should not, should not miss. And a food tour in Amritsar with City On Pedals is a perfect way to treat your taste buds to a party. Kulche served hot at Jamadar di Haveli. If you think it was over, think again. When it comes to food, Amritsar will continue to throw delicious surprises at every corner. Think piping hot pooris straight out of the kadhayi, served with chhole at Vinod di Hatti, Aalu Kulchas at Jass Kulcha, Jalebis at Gurdas Ram Jalebi Wala, and the Punjabi anaesthetic, Gian di Lassi to wash it all down. Some of these places are easy to miss. A street food tour with City On Pedals will make sure that doesn’t happen and that the yummy in your tummy is duly fed for. Lohri Special Mithayi. Food Tour, Amritsar. Despite the quite recent urban landscaping, much of Amritsar still thrives with energy and quirks in the back alleys and walkways hidden in plain sight. It is where the old city architecture, the people, and the frenzied bazars, holding secrets of their own, just spring to life. The Amritsar Heritage Walk with City On Pedals takes you back in time as you make your way deep inside the walled city and explore it in all its exuberance. Qila Ahluwalia, Bangle Bazar, Darshan Deori, Baba Bohar, and Thakurdwara Dariana Mal are some of the many highlights of the tour. Get to taste lip-smacking street food while you’re at it. The Beating Retreat Ceremony at Wagah Border, popularly known as the Lowering of Flags Ceremony, is a pompous affair. A chest-thumping display of military orchestration bordering (pun intended) on theatricality. While most will be overcome with patriotism of the highest order, some might find it a little too, for lack of a better word and considering the relations between the two nations, hostile. I belong to the latter category. That being said, the ceremony is worth seeing at least once. You can leave the paperwork and rest of the formalities to City On Pedals and opt for their Wagah Border Tour. Just make sure you are seated an hour before the ceremony begins (5.30 pm in summer and 4.30 pm in winter) or you might miss out altogether. While you’re at it, you can also make a quick visit to Pul Kanjari, a deserted army bunker, and Mata Lal Devi Temple. It’s all included. Beating Retreat Ceremony, Wagah Border. Pul Kanjari, Amritsar. Picture by Lifeoutside2by2 aka Kanika Gupta. Let me know in the comments how your experience turned out to be in Amritsar. If there are any places you would like me to see the next time around, do let me know. Till then, I’ll leave you with a few pictures. Travel responsibly; travel safe! Don’t be in a pickle. Just pick one. Thanks a lot, Suchita. Your comments always make my day.